Original Antique Maps and Prints. "Atlas de Toutes les Parties Connues du Globe Terrestre, Dresse pour l'Histoire Philosophique et Politique des Etablissemens et du Commerce des Europeens dans les Deux Indes", 1780. Artists and Engravers: Made by'Rigobert Bonne' after'Guillaume Thomas Raynal'. In 1773 he succeeded Jacques Bellin as Royal Cartographer to France in the office of the Hydrographer at the Depôt de la Marine. Working in his official capacity Bonne compiled some of the most detailed and accurate maps of the period. Bonne's work represents an important step in the evolution of the cartographic ideology away from the decorative work of the 17th and early 18th century towards a more detail oriented and practical aesthetic. With regard to the rendering of terrain Bonne maps bear many stylistic similarities to those of his predecessor, Bellin. However, Bonne maps generally abandon such common 18th century decorative features such as hand coloring, elaborate decorative cartouches, and compass roses. While mostly focusing on coastal regions, the work of Bonne is highly regarded for its detail, historical importance, and overall aesthetic appeal. Guillaume Thomas Raynal (April 12, 1711 - March 6, 1796) was a French writer, philosopher, and historian active during the Enlightenment. Raynal was educated as a Jesuit, but left the order for unknown reasons, and moved to Paris where he dedicated himself to the production of a number of minor but popular historical works. Raynal's histories opened doors to elite social and artistic circles where he met and befriended various members of the Philosophe Coteries. Raynal's most important work is generally considered to be a 1770 collaboration with Diderot and others entitled, L'Histoire philosophique et politique des établissements et du commerce des Européens dans les deux Indes. Some of the philosophical ideas developed in the book drew negative attention from the authorities who banned the book and posted a notice for the arrest of its authors. Raynal fled to Berlin and later to St. Petersburg, where he lived for a number of years before returning to France in 1787. Though not a cartographer Raynal's name is often attached to several Atlases by Rigobert Bonne, from whom he composed the text. 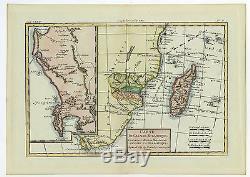 Subject: Antique print, titled:'Carte Du Canal De Mozambique. The main map, on the right, covers from the Cape of Good Hope north as far as Zanzibar and modern day Kenya, focusing on the gold rich kingdom of Monomotapa. This region, today part of Mozambique and Zimbabwe, was once rich in gold and was often associated with the Biblical kingdom of Ophir. Just north of Monomotapa a very embryonic mapping of Lake Malawi appears with no defined northern terminus. Offshore Madagascar and the many Indian Ocean islands surrounding it are well mapped. Arrows show the direction of tradewinds and dotted lines identify some offshore reefs and other dangers. The secondary map, occupying the left hand quadrants of the chart, details the Dutch claims in the western of South Africa from the Cape of Good Hope north as far as St. Notes various indigenous groups, forts, mountain ranges and rivers. Also notes Robben Island surrounded by depth soundings. Condition: Size (in cm): The overall size is ca. 37.3 x 26.5 cm. The image size is ca. 31.4 x 20.8 cm. Size (in inch): The overall size is ca. 14.7 x 10.4 inch. 12.4 x 8.2 inch. Medium: Copperplate engraving / etching with hand colouring on hand laid paper. The item "Antique Print-SOUTH AFRICA-MADAGASCAR-MOZAMBIQUE-Raynal-Bonne-1780" is in sale since Thursday, March 16, 2017. This item is in the category "Antiques\Maps, Atlases & Globes\Africa Maps". The seller is "theprintscollectoruk" and is located in Zeeland.